Since the beginning of the Las Vegas Summer League, many eyes have turned to the ninth overall selection in the NBA Draft. 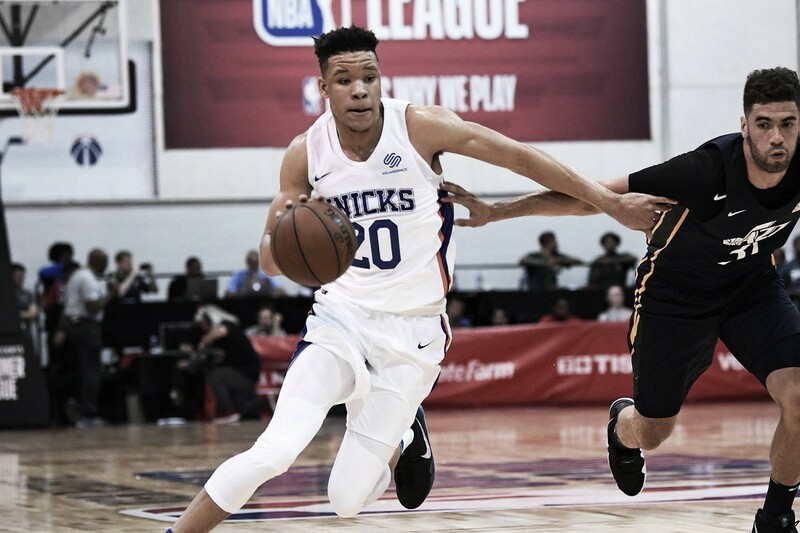 Kevin Knox has proven early on the New York Knicks made the right decision to draft him. "With the ninth pick in the 2018 NBA Draft, the New York Knicks select Kevin Knox, from the University of Kentucky." NBA commissioner Adam Silver read on draft night. Immediately following was a chorus of boos rang in the Barclays Center. At the time, New York Knicks fans did not understand the decision. As Knox was on stage taking his picture with his hat and jersey, Knicks fans could be heard chanting, "We want Porter!" How did Knox handle it? Like a pro. "I like that. That is motivation. A lot [of people] in the city want Porter, but I'm ready to work. I'm ready get to the organization and try to win some games." Knox told ESPN reporter Maria Taylor. Even thought it is early in his career, Knicks fans have changed their tune a little when it comes to Knox. July 7, 2018. 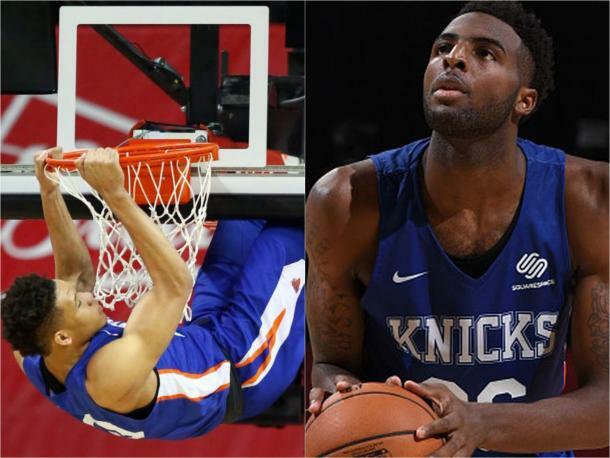 The Knicks took on the Atlanta Hawks in their first game of the 2018 Las Vegas Summer League. Knox's introduction to the league included 22 points, eight rebounds and two assists in 30 minutes of action. Knox would shot 8 of 20 from the field and hit one three pointer. How would Knox follow that up? Against the Utah Jazz, Knox shot 33.3 percent, finishing the game with 19 points, five rebounds and two assists. Knox hit seven free throw out of the eight attempts and added two steals to his resume. In the 109-92 loss to the Los Angeles Lakers, Knox would have another great performance. Knox scored 29 points with nine rebounds and two assists. His seven turnovers may be a bit of a concern but, following this performance the Knicks knew they have something special. In Knox's final appearance of the Summer League, he shot 25 percent from the field, finishing the game with 15 points, four rebounds and three assists in the loss to the Boston Celtics. All together, the 18-year-old finished the summer league averaging 21.3 points, 6.5 rebounds, 2.3 assists and one block per game. Knox finished fourth in the Summer League in points scored per game. First-round pick Kevin Knox (left) and second-round pick Mitchell Robinson (right). With Knox and Robinson now in place, the new era of Knicks basketball has officially begun. Knox has the potential to possibly steal Rookie of the Year honors from the likes of Deandre Ayton, Luka Doncic and Marvin Bagley III. Robinson has the chance to evolve and become one of the best centers in the league. Knox has the potential to be develop into what Jayson Tatum did for the Boston Celtics. Knox is the 3-and-D wing perfect for the Knicks’ rotation. At 6-foot-9 with a near-7-foot wingspan, Knox can shoot anywhere from the floor and can defend on a high level. Combine them with Kristap Porzingis and Emmanuel Mudiay and the Knicks have the possibility of winning eight to 10 games more than they did a season ago. Hopefully, this is the first step to the Knicks emerging from the shadows of Carmelo Anthony, Patrick Ewing, Charles Oakley, John Starks and other ghosts of New York's past that could not deliver a championship to the Big Apple. New York has not won a championship since 1973 and have not made the playoffs since 2013.